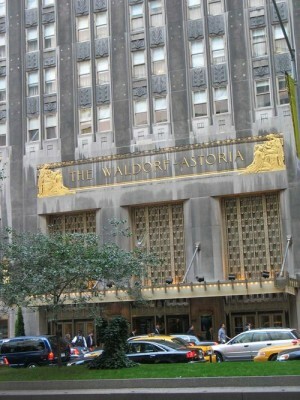 The Waldorf-Astoria Hotel is a luxury hotel in New York. It has been housed in two historic landmark buildings in New York City. The first, designed by architect Henry J. Hardenbergh, was on the Fifth Avenue site of the Empire State Building. The present building at 301 Park Avenue in Manhattan is a 47 story, 625 ft. (191 m) Art Deco landmark, designed by architects Schultze and Weaver and dating from 1931. The Waldorf Astoria New York is a member of Hilton's Luxury and Lifestyle Brands along with The Waldorf=Astoria Collection and Conrad Hotels & Resorts. 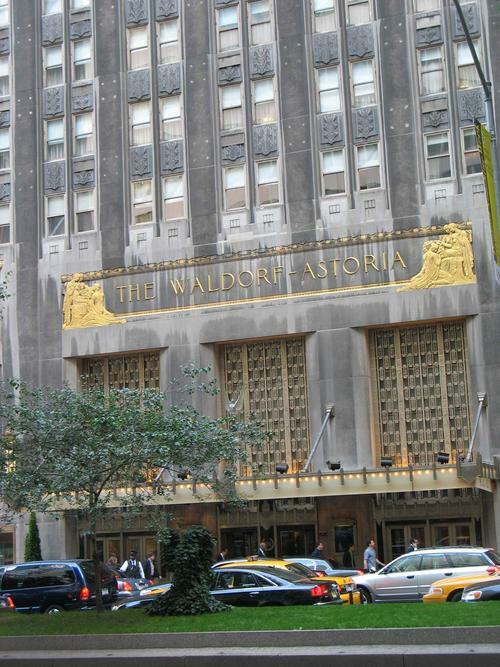 The Waldorf Astoria brand consists of the Waldorf Astoria in New York and The Waldorf Astoria Orlando. The hotel is now branded as the Waldorf=Astoria, with a double hyphen, but originally a single hyphen was employed between "Waldorf" and "Astoria," as recalled by a popular expression and song, "Meet Me at the Hyphen". The modern hotel has three American and classic European restaurants, and a beauty parlor located off the main lobby. Several boutiques surround the lobby. A "hotel within a hotel" in its upper section is known as The Waldorf Towers operated by Conrad Hotels & Resorts.